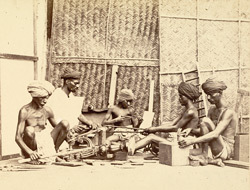 Photograph of carpenters at work at Madras in Tamil Nadu, taken by Nicholas & Curths in c. 1870, from the Archaeological Survey of India Collections. This image of a group posed with various tools is from the series of 'Photographs illustrating various native classes, occupations, &c....Native carpenters at work', shown at the Vienna Exhibition of 1873. Carpenters and woodcarvers in Tamil Nadu come from the Kammaalar caste and the type of work performed is dictated by caste divisions. Carpenters produce complex carved work for temples, including temple cars, ornately carved front doors and verandah columns for houses, musical instruments and agricultural implements. After photography was introduced into India in the 1840s it rapidly grew in popularity, particularly as a means to record the vast diversity of people and their dress, manners, trades, customs and religions. Amateur photographers became increasingly interested in ethnography. In the early 1860s the Governor General of India Lord Canning commissioned ethnographical photographs for the whole of India.